Many countries, New Zealand included, are funding adolescent pre-professional sporting programmes in high schools with increasing regularity. Dance however is still considered by many to be purely an art form and those who participate within it are artists without the dual title of athletes. This then leads to a lack of appropriate medical care of dancers and subsequently poorly managed dance-related injuries. Common scenario: two 12-year-old girls have ankle injuries. One plays football and the other dances. The football player is told to rehabilitate effectively. The dancer is told to stop dancing. Common scenario: two 16-year-old girls have hips injuries. One plays netball and the other dances. The netball player is assessed and given exercises based on her sport. The dancer is not assessed in turned out positions. Is dance at fault? Or is how we view dance the issue? Considering so many young people in New Zealand engage in many forms of dance, surely there is a better option? One of the most challenging forms of dance is the practice of dancing classical ballet on pointe. This form originated in the early 1800s and has progressed through the decades with increasing popularity and equally increasing difficulty. It is now seen as a social rite of passage for many young ballet dancers. General belief states that reaching 12 years of age is the main pre-requisite to beginning to dance on pointe. Unfortunately, there is no robust body of medical evidence to suggest that age is the most important and definitive factor. The result of this guideline is to treat all dancers the same, despite individual growth and development issues, and this typically leads to preventable lower limb injuries and feet with significant structural changes, such as bunions in dancers as young as 13 years old. Global research is currently looking at the benefits of dance schools incorporating medically-based pre-pointe assessments into their curriculum to ensure that dancers are properly managed. Assessment criteria includes testing strength (of the feet, ankles, legs and core), flexibility (of joints as well as muscles) and proprioception (awareness of the body within space) to effectively define an individual dance student’s readiness for pointe work. Such simple but effective testing outcomes view the dancer as an individual and allow the guidelines to fit the dancer and not the other way around. Such easily replicable testing outcomes for example include appropriate joint range of motion for the ankle. With the leg extended, a straight line from the inside of the shin to the inside ankle bone and to the ball of foot when pointed should achieve a range of close to 180 degrees. Any lack of range, or conversely excessive range, forces compensations in other areas of the body and can lead to ankle, knee and hip injuries. Likewise, the ball of foot range needs to be 90 degrees to ensure a proper ‘demi pointe’ position. Any limitation here forces the ankle into malalignment as it transitions from demi to full pointe and this can lead to preventable ankle injuries. Despite the logic of such measurements and their associated outcomes, we live in a world where more is better and flexibility often over-rides strength. Instead we need to protect young dancers from injury. Not many will achieve success in the commercial dance world but safe guarding against lifelong pain and disability should be the first priority. In this way such images (A) can be a thing of the past in a 13 year old. 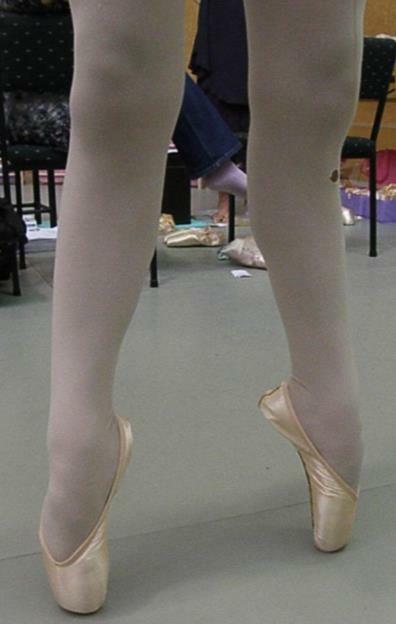 These photos of feet, in a non-weight bearing pointed posture and standing ‘on pointe’ do not present feet with appropriate intrinsic foot muscle strength and so the feet are sinking into the pointe shoe which then in turn cannot support the dancer’s weight. Internal foot muscle strength (as well as general body conditioning) should be the focus for all pre-pointe and pointe dancers. Toe movement and strength involves a mix of activating muscles from inside and outside the foot. When the intrinsic (inside) toe muscles are ignored for the larger stronger extrinsic muscles, the foot is ‘pointed’ with the external lower calf muscles only and this makes a ‘fist’ with the foot which leads to curled toes. This way of pointing bends all the joints in the toes as well as the ball of foot joints. When put on pointe the toe joints then have to bear all the body weight and they distort under the pressure. The foot ends up sitting in the end of the shoe with the toes carrying the weight. The most unrecognised fact of dancing en pointe is that the weight of the body should not be forced onto the toes but instead dispersed from the metatarsal heads (ball of the foot) through the shoe and into the floor. 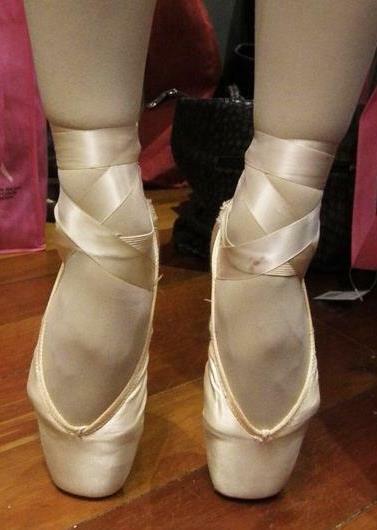 If the dancer does not have strong enough feet, then no pointe shoe will effectively support them. A number of Canterbury dance schools are growing an increasing knowledge of dance bio-mechanics and they are incorporating a mix of pre-pointe strength training programmes and assessments into their repertoire to ensure that the dancer is safe. The result is a dancer with stronger feet and lower limbs and a clearer knowledge of their body, which allows them to better self-manage future injury potentials. This is a much better outcome than (A)! But despite the various Canterbury region dance school initiatives, how does New Zealand fare in this changing landscape? Are we being left behind on the global scene? There are many medical professionals actively involved in dance medicine in New Zealand, but are they are being under-utilised. The social construct of the under-funded arts is outdated and serves no function but to undermine the needs of those it professes to celebrate – the dancers. The change is being initiated from the bottom, today’s young dancers are better medically-managed than any previous generation. But where do we stand on the international scene? Are we to always look abroad for best practice? Why, with so many in this country making changes? New Zealand is constantly and consistently making progress in dance medicine and we have the opportunity to lead the way in simple but effective techniques to protect our young dancers from injuries. The question is - what happens to the 12-year-old who has an ankle injury and dances. Is she to be valued as highly as the football-playing child? Do we care enough to change policy? Or do we still to tell her to stop? Georgina Barr started her podiatry career in response to the Christchurch earthquakes after working in the arts sector. Georgina works full time at SportsMed in Christchurch. She also runs her own business, Barrina Ltd, where she provides a custom pointe shoe fitting service, lectures on anatomy and biomechanical physiology and engages in dance mentoring. Georgina created the Podiatrist for Dancers Facebook page to allow open connections between dancers and the sharing of knowledge on managing dance injuries. She also created pre-pointe and dance assessments for ballet dancers wanting to progress to pointe work, and works with the Juon Pointe System. Swiss-born Esther Juon initially trained as a classical dancer with the Opera House, Zurich. Injury in London ended her dance career but was the catalyst for her life’s work in teaching safe dance practice, which includes creating a reliable system for assessing and fitting pointe shoes. Esther was invited by Nicolas Grishko to fit pointe shoes at the famous Bolshoi Ballet in Moscow and in recognition of her contribution to the safe fitting of pointe shoes, Esther was awarded a Special Diploma by the Diaghilev Association in 1995. Esther has published articles in 'Young Dancer' magazine, has written a book called Pointe Shoe Secrets, and has presented lectures at British Ballet Organisation, at regional R.A.D. courses, at the London's Children Ballet and at various ballet schools in the UK and Ireland and New Zealand. Esther’s work has also been presented at IADMS (International Association for Dance Medicine & Science). Esther is a member of IADMS, and a teaching member of BBO. Original generation time 1.4868 seconds. Cache Loaded in: 0.0004 seconds.